Many pet owners believe giving their pet aspirin will help to ease the discomfort after treatment for infection with Heartworms. 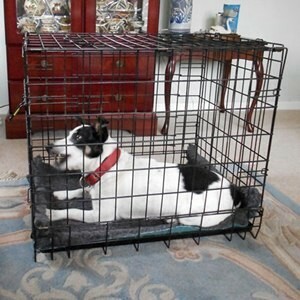 This is a natural response of any owner, to try to help their dog when he is in pain. However there are dangers associated with Aspirin and Heartworm Treatment. Find out why you should not give your pet aspirin UNLESS your veterinarian advises it is acceptable. The standard protocol of heartworm treatment for dogs infected with adult worms is to prescribe an anti-inflammatory medication (we are not talking here about heartworm preventatives). Anti inflammatory drugs are given to relieve the pain and joint inflammation associated with Immiticide treatment. Aspirin can help minimize blood clots when a pet is treated for heartworms. In some cases, veterinarians may recommend aspirin. However, if you give your pet aspirin without checking with your pet’s doctor, you may cause harm to your beloved furry family member. Aspirin is known to react with other nonsteroidal anti-inflammatory drugs (NSAIDs) and Prednisone. Both drugs may be used in pre-treatment in the heartworm treatment protocol. Prednisone is a corticosteroid that effectively relieves joint pain and inflammation. Many veterinarians will give a prescribed dose of prednisone during the treatment process of heartworms. Unfortunately, many pet owners do not know that aspirin reacts adversely with prednisone. Aspirin can reduce the effectiveness of prednisone, or it can amplify the side effects of prednisone. The combination of both drugs in the body can cause an allergic reaction in many pets. If your pet is suffering with pain after treatment, you should speak with your veterinarian to make sure it is safe to give your pet a dose of aspirin. The veterinarian will determine if enough time has passed between the administration of prednisone and the dose of aspirin. Some veterinarians will pre-treat with NSAIDs instead of prednisone. Aspirin is a unique NSAID as it is the only one that can reduce blood clotting over a long period. Other NSAIDs can reduce clots, but only briefly. Even in humans, great care must be taken if aspirin is prescribed in combination with another NSAID. It is common to prescribe a combination of NSAIDs to treat arthritis pain in humans. However, the doses must be exact in order to avoid complications. For animals, it is just as important to provide an appropriate dose. It is imperative you follow instructions and give the exact dose that is recommended. 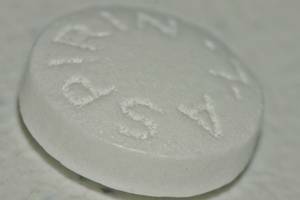 Aspirin is sold under several brand names. In addition, many drugstores carry generic brands. All of these NSAIDs are for human use and do not provide recommended doses for pets. Unfortunately, many people believe NSAIDs are safe for pets. However, all NSAIDs including aspirin have side effects. In dogs, some will cause cartilage damage or ulcers in the abdominal lining. It is likely your veterinarian will use one of the NSAIDs for animals during treatment for heart worms. The reaction between animal NSAIDs and aspirin will vary depending on the dosage of each drug. The only way you can know the appropriate dose is to ask your veterinarian. It is a common practice and belief among pet owners that aspirin is safe for their pets. However, this depends on whether the animal is being treated with other medications. Since animals are sensitive to aspirin, always give the aspirin with food. For the safety of your pet, always ask your pet’s doctor if it is acceptable to give your pet aspirin. Strictly adhere to the dosage recommendation.